I heard a comment at the Volatility Institute’s annual conference last week which made me want to do a little digging. Charles Himmelberg of Goldman Sachs wondered aloud if the US is returning to what economists call the Great Moderation. This is period of a fairly stable economy as measured by the volatility of macroeconomic variables starting in the 1990s. I general I think reduced uncertainly about the likely evolution of the economy is a good thing as it allows businesses and households to plan for the future, take the risk of new ventures and to hold lower levels of precautionary savings. There is a sort of unburnt scrub theory of finance drawn on analogy to forest fires. If the rangers run and put out every little forest fire as soon as smoke is sighted, then fuel builds up and the fire which eventually comes is devastating. In the economy, it could be the case that long periods of low volatility could make the eventual shock even more devastating. 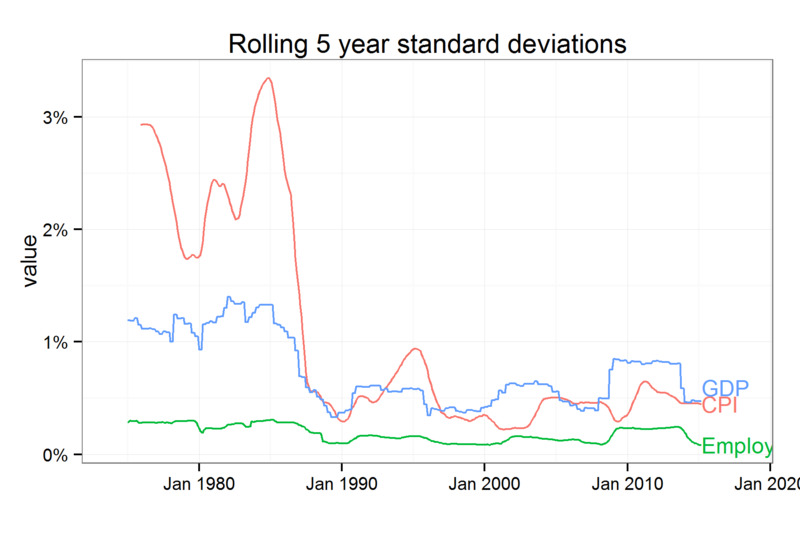 The chart below shows the 5 year standard deviation of output, employment and inflation. On this chart, the volatility of CPI, Employment and GDP all look substantially lower in 1990 – 2005 than 1970-1990. To some extent how you answer the question about a renewed period of moderation will be based on where you think the economy is in relation to the Great Recession. If you consider us still in the grip of post crisis aftershocks, then no number crunching is likely to convince you. Source: Federal Reserve Bank of St. Louis, Astor calculations. To me, however, it looks like Mr. Himmelberg is onto something. I see volatility of the most important macro variables returning (for now!) to their low 1990-2005 levels. I am not drawing a sharp lesson from this, I highlight it only because I had not quite realized the extent to which the this aspect of economy has returned to pre-crisis patterns.